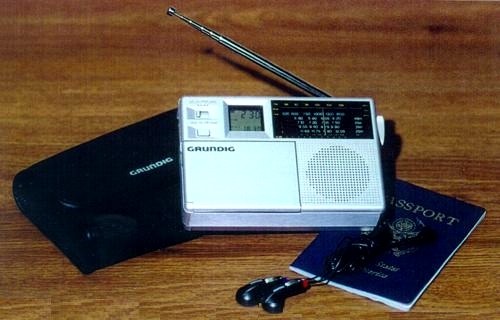 The Grundig Traveller II PE Analog receiver covers AM, FM and five shortwave bands: 5.8-6.2, 7.1-7.5, 9.5-9.9, 11.65-12.05 and 15.1-15.6 MHz. 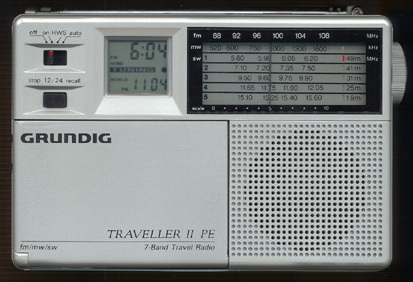 The Traveller II PE Analog features a 12/24 hour LCD world clock alarm-timer with sleep function (1-59 minutes). The alarm function can be set to turn on the radio or to sound a buzzer. The buzzer has a special HWS Humane Wake System. When the buzzer starts it is soft, and gets gradually louder to wake you gently. Under a special flip-cover, there is a 24 position rotary dial to select 24 major cities for quick indication of international times. 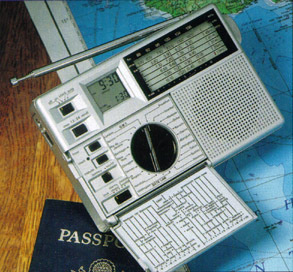 The left side of the radio features a 3 VDC input jack and earphone jack (3.5mm). Only 5.5W x 3.7H x 1.4D inches 16 oz (140x95x36mm 450 g). Includes: three AA cells, earphone and carry case. Click here to view with case and earphones. The earlier Traveller II was similar, but dark gray. Copyright 1999-2015 Universal Radio, Inc.